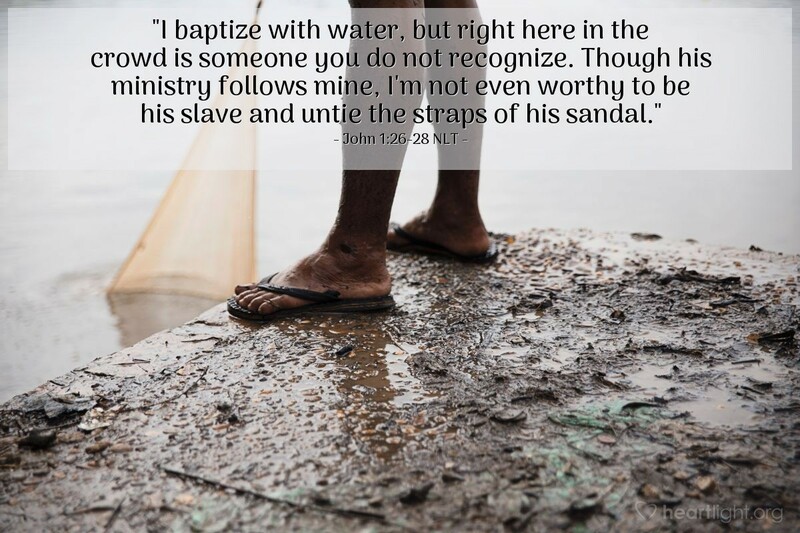 John told them, "I baptize with water, but right here in the crowd is someone you do not recognize. Though his ministry follows mine, I'm not even worthy to be his slave and untie the straps of his sandal." This encounter took place in Bethany, an area east of the Jordan River, where John was baptizing. "A long time ago in a galaxy far, far away..."© If we are not careful, we can find ourselves looking at the story of Jesus as we view a work of good fiction. In his gospel, John wants us to know that his account of Jesus is more than just a good tale. It is a story about real places, real people, and a real Savior. Yes, there was real water for baptism. There was a real city around which all of these things involving John the Baptizer happened. There were real, everyday people who came to this place along the Jordan River to open their hearts to the Kingdom of God. Soon, John reminds both them and us, there will be a real Savior on the scene. God will walk among us as Jesus. He will get the dust of the streets on his feet. He will be so great that John said he was not worthy to do the most menial work of a slave — kneel down, unlatch his sandals, and clean his feet. Dirt, sweat, feet, rivers, people, cities, crowds ... real people, real Savior, real Jesus! O what wondrous love you've shown, O God, by sending your perfect Son to live in my imperfect world. O what wondrous grace you've given, dear Father, when you allowed yourself to be soiled by the dust of my existence so that I could live for the praise of your glory. I praise you. I thank you. I love you. In Jesus' name. Amen.